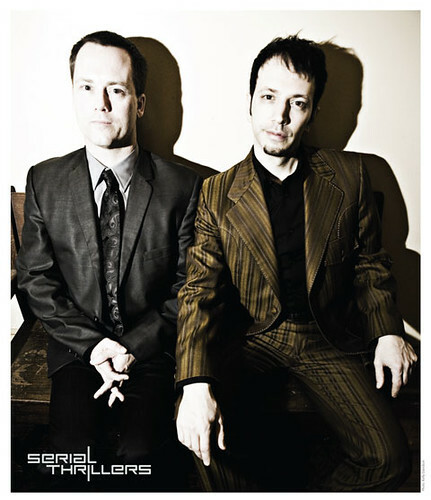 The Boston based Alt-Pop rock duo “Serial Thrillers” is a creation of singer/songwriter Paul Ortolano. The 12-song debut CD “Serial Thrillers” released in late 2008 was produced by Anthony J. Resta (Collective Soul, Duran Duran, Shawn Mullins, Perry Farrell) is a powerful taste of edgy pop revisiting classic album rock. Ortolano and long time collaborator Stephen Clements have worked together in several bands, sharing stages with the likes of King’s X, Godsmack, Howie Day, Big Wreck, The Tubes, Warrant and Extreme. They also teamed up with New Wave front girl and legendary singer Dale Bozzio for a tour with (one of Gwen Stefani’s favorite super groups) Missing Persons. Over the past several years they’ve kept busy writing, recording, and playing venues in the US, as well as doing live on-air interviews and performances at numerous rock and college stations in New England. Additionally, Stephen’s studio session work and Paul’s guitar work have been featured on radio remixes for RCA Records and Hollywood Records. Born from a diverse background of musical talent, technology, and media exploration, the duo brings a dynamic and guitar energized studio sound to the live stage accompanied by visual textures of synchronized lighting and original video art/Indie film clips to saturate the senses. The songs, written by Paul Ortolano, are Serial Thrillers’ foundation – unusual, beautiful compositions with influences that span from pop to progressive and lyrics that can cut with a blunt edge, or mix fiction and autobiography into delightfully ambiguous landscapes. From the melodious twists and turns of songs like “Defied”, to the upbeat shuffle & honesty of “So Beautiful”, to the bold commentary of straight up rock tracks “Unattractive” and “Miss Black and White, “Serial Thrillers” has something for just about everyone. The band is gearing up for tour dates in the Winter/Spring of 2011 to support the release of their new Single “So Beautiful” to HotAC radio across the US, and the world via the internet. Downloads and physical copies of their Debut album, their new “F5” EP, & all singles are available at www.Serial-Thrillers.com, itunes, Cdbaby, myspace, and many other web & retail outlets. Paul Ortolano: Vocals, Guitars, Bass, other things. Stephen Clements: Drums, percussion, unbelievable antics.